Roshanna, the owner of a new start-up near Lees Summit, MO, contacted us a couple of weeks ago. She is starting a salon and beauty bar business which allow stylists to be their own boss and run their own business. Something different from the typical salon. We got to work right away on Roshanna’s site and had all of her content loaded and pictures added within 48 hours of receiving the information. Due to some family issues, she then had to divert her attention for a couple of weeks away from the website. Roshanna then contacted us last night and worked with us over the phone to polish up the site and make the final changes that she wanted on the site – and today the site is now published! We appreciate the business from Roshanna and were glad that we could help make a salon website design for her! 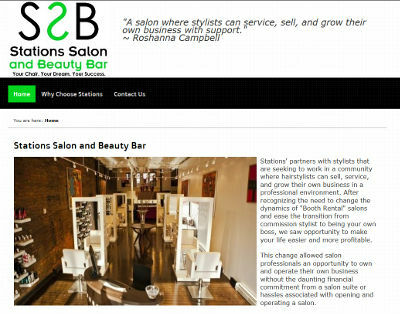 Stations Salon and Beauty Bar’s website is at stationssalonkc.com.